Husna Yapi ve Gemi Malzemeleri is located very close to the shipyard region in Istanbul Turkey. Established in 1989, the Turkish company started production of brass door handles and furniture accessories. In 2003, they have started to built side scuttles and windows for the dockyards and ship sector. The company’s products have A-60 and A-0 fire-proof certificates and have been tested by the “Warrington Fire Research” in U.K. The scuttles and windows’ also possess “Type Approval Certificate” from Bureau Veritas. Turkish company’s product range covers solutions for every kind of civil and military ships, oil and gas tankers, tugboats and other transportations of sea. 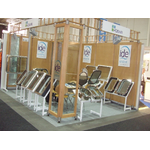 Husna Yapi ve Gemi Malzemeleri manufactures high quality side scuttles and ship windows. The company’s products have A-60 and A-0 fire-proof certificates and have been tested by the “Warrington Fire Research” in U.K. The scuttles and windows’ also possess “Type Approval Certificate” from Bureau Veritas. Turkish company’s product range covers solutions for every kind of civil and military ships, oil and gas tankers, tugboats and other transportation vessels of sea. The organization is interested in becoming a long term supplier of companies which are building ships as their core activities. Moreover, it is also open to trade intermediary agreements with the potential partners which can promote the company’s products in their own region and have a good access to the shipyards and ship-owners. The Turkish company is willing to sign commercial agreements with the interested partners (ship-owners, and ship yards) that are active in maritime sector especially in shipbuilding.